Choosing a Finder thermostat means that you can adjust the temperature easily and instantly, to create the ideal atmosphere. Finder's has developed the model 1T.51 for recessed mounting inside wall modules. Simple, compact, available in white or black versions, it comes with all of Finder's technology. Like the ECO 1 function, which minimizes temperature fluctuations in the environment, increasing comfort and lowering fuel consumption. The Finder 1T.41 FASTSET is a simple and direct thermostat, both in form and in use. The temperature is adjusted through the convenient circular regulator, and in a moment you get the desired climate. Top reliability for an unbeatable quality product. The 1T.01 thermostat is the entry level product of the range, designed for the simplest applications. Just act on the wheel to adjust the temperature directly, while a warning light tells you if the system is working. Simple, fast and straightforward. 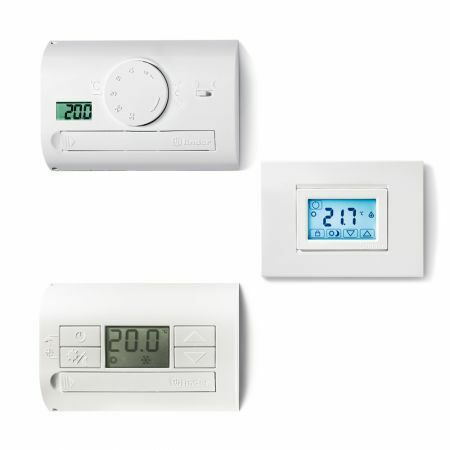 These are the features of the digital wall thermostat model 1T.31. Thanks to the LCD display and setting keys, you can select the desired temperature or navigate between the various functions (antifreeze, OFF, summer, winter) easily.